MainAll NewsInside IsraelWill US Ambassador visit Gush Etzion? Will US Ambassador visit Gush Etzion? US Ambassador David Friedman invited to memorial service for murdered American teen in Gush Etzion. Will he attend? Will the US Ambassador to Israel make an official visit to an unregistered hilltop ‘outpost’ in Judea next week? The Orot Yehuda Yeshiva in Efrat is planning a memorial service later this month to mark the second anniversary of the murder of Ezra Yehiel Schwartz, an 18-year-old American yeshiva student who was killed along with two others in a terror attack in Gush Etzion south of Jerusalem. This year’s memorial service, planned for next Tuesday beginning at 11:30 a.m., will be held at the Oz VeGaon nature preserve – a Gush Etzion park established to honor the memories of three murdered Israeli youths kidnapped by Hamas terrorists in 2014. While initially dedicated to the memory of the three murdered Israeli teens kidnapped in 2014, in December 2015, a month after their son’s death, the Schwartz family sponsored the paving of a new hiking trail in Ezra’s honor. Schwartz was killed near the Oz VeGaon preserve, and had planned to visit it after he finished handing out snacks to soldiers stationed in the area. 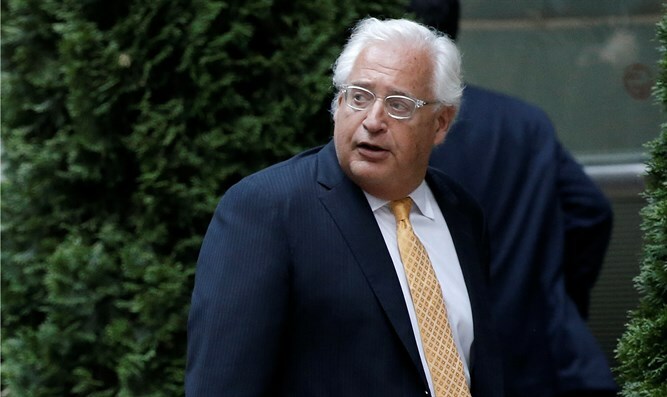 Because Schwartz was an American citizen, yeshiva officials organizing next week’s memorial service reached out to the US Embassy in Tel Aviv, inviting Ambassador David Friedman to attend the event. While the embassy itself declined to comment on the invitation, citing its policy of not disclosing the ambassador’s schedule, organizers say Ambassador Friedman has accepted the invitation. “As per our policy, we do not respond to questions regarding the ambassador’s schedule,” an embassy spokesperson said. Yeshiva officials say they are in contact with embassy security staff to coordinate Ambassador Friedman’s visit. The Schwartz family has said it will be unable to attend next week’s memorial event and expressed their appreciation for Friedman’s decision to take part in the service.